A special post on Big Sur Waterfalls here. 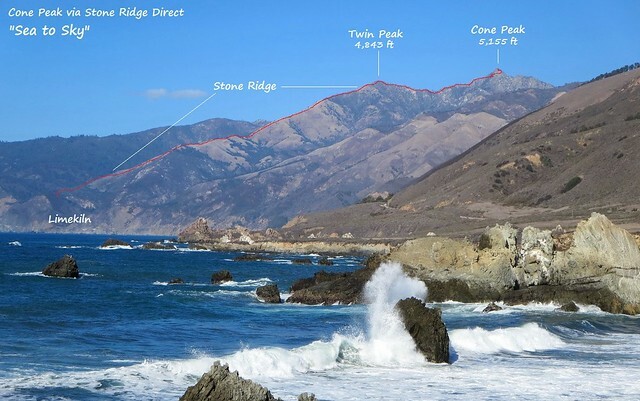 The Big Sur region is an adventure running playground. 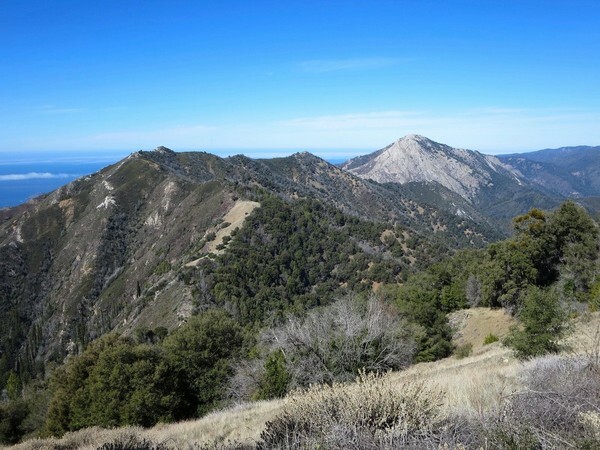 The Ventana Wilderness, Silver Peak Wilderness and a handful of state parks form a network of protected public land over the northern half of the Santa Lucia Mountain Range that is one of the greatest coastal wilderness regions anywhere. The steep degree of relief from the ocean to the mountaintops is unmatched in the contiguous United States providing dramatic vistas throughout the coast. Perhaps one of the most magical Big Sur experiences is a clear day when the ridgetop views include a backdrop of the deep blue Pacific Ocean transitioning to turquoise near the coastline. However, a foggy day along the coast can be equally fascinating as the marine layer interacts with the terrain. In the interior of the wilderness, deep, shady canyons slice through the Santa Lucia Mountains and are filled with ancient redwoods, waterfalls, gorges and mystique. The higher reaches of the wilderness are characterized by rugged, rocky summits with rare groves of the stately Santa Lucia Fir, endemic to these mountains and one of my favorite tree species. Iconic spots like Bixby Bridge and McWay Falls draw millions of visitors to the Big Sur Coast, but with the exception of Sykes Hot Springs, a minuscule fraction travel far from the highway leaving a vast wilderness where solitude, intrigue, and a substantial amount of brush can be found. Adventuring in Big Sur and the Ventana Wilderness is certainly possible in the summer months if travel is restricted to the immediate coast and the cool canyons, but the higher terrain can be extremely hot resulting in copious sweat, biting black flies, and active rattlesnakes. Therefore, the ideal time for exploration is from late fall through late spring when the air temperature is cooler, bugs are minimal, and the snakes are dormant. Furthermore, the winter months can provide a special treat when the occasional storm drops several inches of snow on the summits providing a unique experience of coastal views combined with snow. These same storms bring downpours to the lower elevations, enlivening the vegetation and numerous waterfalls. I have done several adventures in Big Sur over the years, but it took until last winter for me to become captivated by the phenomenal beauty of this region and gain a desire to explore the land in-depth. The result has been a bevy of awesome explorations and much inspiration for future adventures. This post compiles all of my Big Sur outings separated by sub-region categories that I came up with that made sense to me, generally organized from north to south. Most of the trips link to a dedicated blog post with many photos and a description of the adventure, but some only link to photo albums. This post also includes an array of some of my favorite photos from the region. 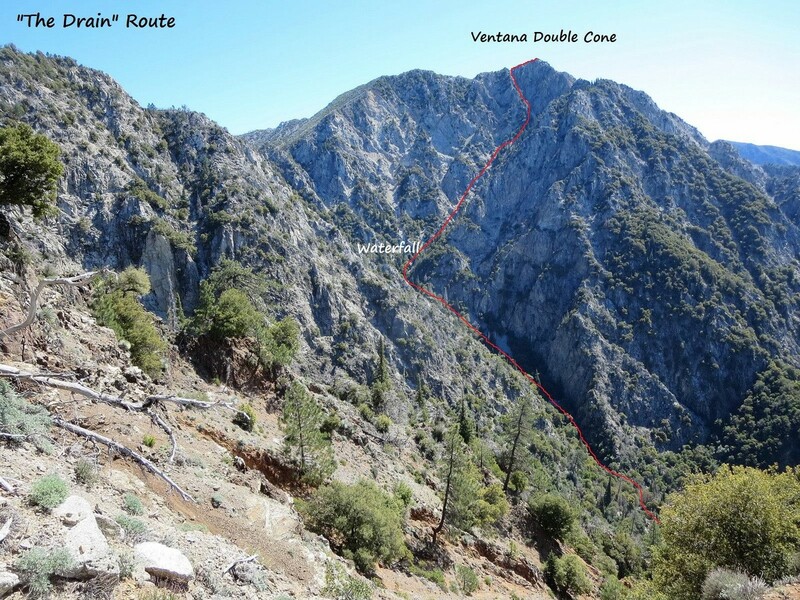 The best resource to use when planning your adventure is Big Sur Trail Map, which includes wilderness trail conditions, donwloadable topographic trail maps and a route metrics generator. The Ventana Wliderness Aliance Forum also includes trip reports where the most recent conditions can be found. Feel free to ask me for any additional tips or information. As there is still a lot for me to explore in Big Sur I will continue to update this post. Big Creek Reserve (May 10, 2014) – Open to the public one day each year! Point Lobos: Located at the northern end of the Big Sur Coast, Point Lobos State Reserve is very popular, especially on sunny weekends. The park features numerous rocky promontories, picturesque coves and a pretty Monterey pine forest. There are many trails in the reserve that are good for a shorter run or a post-adventure stroll. Pacific Valley Bluff: Spectacular sea stacks with Cone Peak & Stone Ridge as a backdrop. Hell, I’m from Big Sur, and you take far better pics of it than I ever have!